Mumbai: The Reserve Bank of India (RBI) on Friday opposed government calls to relax the rules for risk weights and capital requirement for Indian banks, while simultaneously announcing its intention to revise existing prudential regulations. The RBI warned that relaxing the current risk-adjusted capital norms, often termed as Basel-III-plus norms, could hit the economy at a time when defaults are high and provisions low. Instead, the central bank now proposes to take a fresh look at exposure and investment guidelines, and the existing risk management framework. In its Trends and Progress Report published on Friday, the central bank said that applying Basel-specified risk weights will understate the “true riskiness” of loans on the books of these banks. At present, the capital adequacy norms for Indian banks are higher than those recommended under Basel. “The case for a recalibration of risk-weights or minimum capital requirements would need to be carefully assessed—frontloading of regulatory relaxations before the structural reforms fully set in and conclusive evidence on sustained improvement in CDRs (cumulative default rates) and LGDs (loss given default) is observed could be detrimental to the interests of the economy,” said the report. The RBI statement follows calls by the government for aligning the capital adequacy norms of Indian banks with those of Basel III to allow Indian banks to lend more. This had become a bone of contention between the RBI and the government, with the latter initiating discussions under Section 7 of the RBI Act. Under Section 7 (1) of the RBI Act of 1934, “the central government may from time to time give such directions to the bank as it may, after consultation with the governor of the bank, consider necessary in the public interest”. Section 7 (2) also gives the government the power to entrust the business of the RBI to its central board of directors. 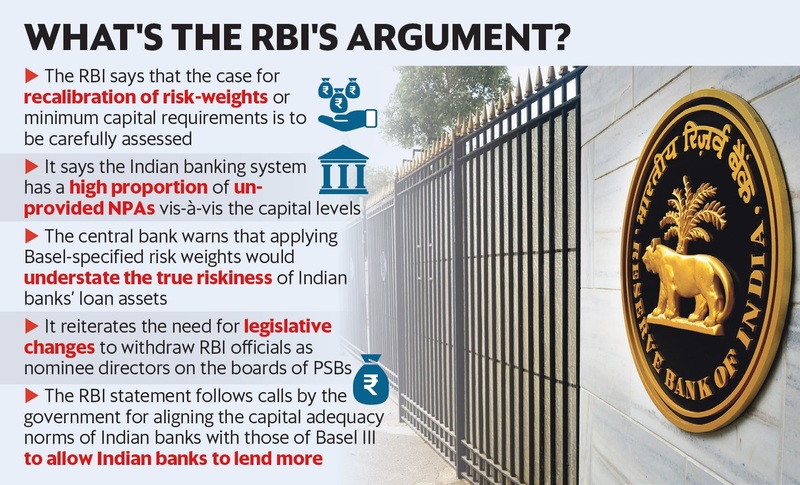 The RBI report further argued that applying Basel-specified risk weights will understate the “true riskiness” of loans on the books of Indian banks. At present, Indian banks carry a high proportion of non-performing assets (NPAs) that are unprovided for, vis-à-vis their capital levels, the report noted. Instead, the central bank suggested that it intends to issue revised prudential regulations, including guidelines on exposure and investment norms, risk management framework and select elements of Basel III capital framework to All India Financial Institutions—investment and development institutions that are crucial to the economy. The RBI also reiterated that legislative changes should be made to do away with the need to nominate the central bank’s officials as nominee directors on the boards of public sector banks. Former governor Urjit Patel had suggested withdrawal of these nominee directors from the boards to avoid any conflict of interest. The central bank is discussing the matter with the finance ministry, Patel had informed the parliamentary standing committee on finance. The RBI is also looking at reviewing the guidelines for compensation for private sector banks, following a demand by banks for an objective assessment of remunerations for whole-time directors, the report said.